This is a crash course with UNB’s top experts. 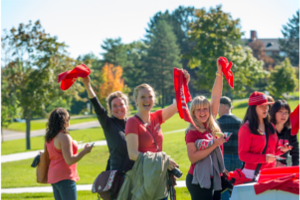 A first-time event at homecoming, this event will help showcase some of UNB’s top research initiatives and demonstrate why UNB was recently named Canada’s Most Entrepreneurial University by Startup Canada. This event is appealing to a large group of alumni, including young alum. This year will focus on New Brunswick made products - wine, beer, cider and meade. Tickets are only $35. Saturday, Sept. 27, 1 p.m.
During the game, seven former players are being recognized as All Canadians. Four of the seven are still living and will attend the ceremony during the game at the BMO field. Scottie and the Stars will perform. A number of booths will be set up: face painting, tye-dying, bean bag toss... and even a bouncy castle! Special guests include some of UNB's best varsity athletes. Everyone is welcome.